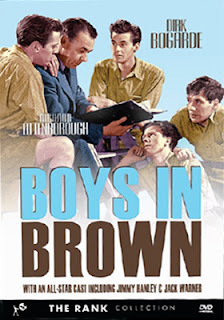 VCI Entertainment has selected June 18 as the DVD debut date for writer/director Montgomery Tully’s 1949 film adaptation of Reginald Beckwith’s stage play, Boys in Brown. This drama about Borstal Prison life (British for juvenile detention center) is of note for two reasons — the casting rising Brit stars Dirk Bogarde and Richard Attenborough as the leads and as a precursor to the uniquely “Kitchen Sink” films that would arrive during the 1950s and early 60s (notably Look Back in Anger and The Loneliness of the Long Distance Runner). It’s not quite social realism that defined the "Kitchen Sink" film movement, but it is damn close and the class distinctions are duly noted. In the early 1980s the showman of showmen was, by any standard, Freddie Mercury. When he put on a show, he PUT ON A SHOW! As a fan; as a concert-goer, you got your money’s worth at a Queen “show” … thank you, Freddie Mercury. 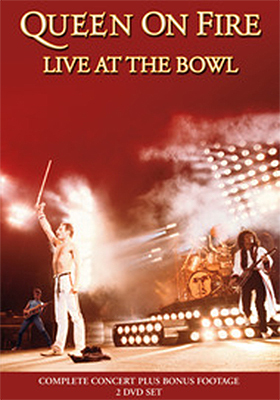 Eagle Rock Entertainment has added the double-disc Queen on Fire: Live at the Bowl, another stunning example of his showmanship to its DVD release calendar for delivery on May 21. This 25-song set showcases just about every hit imaginable at the time (June 1982), including “Somebody To Love,” “Bohemian Rhapsody,” “We Will Rock You” and “We are the Champions.” The companion disc is loaded with interviews, behind-the-scenes and bonus performances. A must for Queen fans! On July 18, look for Breaking Glass Pictures to deliver both Blu-ray and DVD editions of documentary filmmaker Sylvia Caminer’s An Affair of the Heart, a cinematic love letter to some of the most loyal fans in the world. 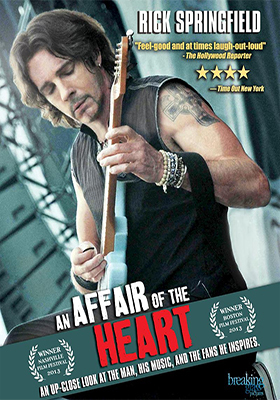 For some 30 years singer and songwriter (and soap star) Rick Springfield has “worked” the audience and fans from all walks of life — just ordinary people for the most part — have gotten it. Through good times and bad, once they get into him, they are hooked forever … and ever … and ever! Using vintage footage, live concert performances, fan interviews (with a few well-known faces thrown in), Caminer spins an infectious narrative that by film’s end will convince even the most hardened of skeptics that Springfield — for better or worse — is the real deal. 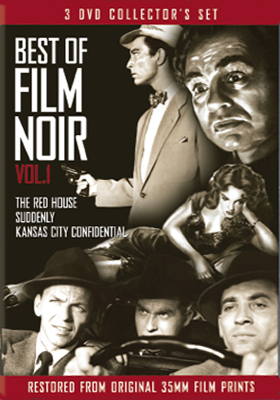 Film Chest will deliver to the collector’s market on May 28 a trio of film noir classics in the DVD release of Best of Film Noir, Volume One. Included in the package are: Director Delmer Daves’ 1947 film adaptation of George Agnew Chamberlain’s novel of the same name, The Red House (with Edward G. Robinson, Judith Anderson and Allene Roberts) and filmmaker Phil Karlson’s 1952 crime thriller, Kansas City Confidential (John Payne, Robert Foster and Coleen Gray, plus such “faces” as Neville Brand, Lee Van Cleef and Jack Elam). Rounding out this stellar collection is Frank Sinatra/Sterling Hayden assassination tale, Suddenly (1954, direction by Lewis Allen). All three films have been restored from the original 35mm prints and include before-and-after restoration examples, audio commentaries and poster galleries. You want crime thrillers? You’re thinking the Mafia; the boys … films like The Godfather, Goodfellas and The Departed right? All are excellent. What is it about these films, and others, that make them so compelling? They have great stories with intricate plots that draw you in, punctuated by violence, betrayal … and more. Well Go USA has selected July 23 as the street date for one of the best in recent memory, writer/director Park Hoon-Jung’s New World. Separate DVD and Blu-ray editions are planned for release. The head of South Korea’s largest crime syndicate — the “Godfather,” if you will — is killed under mysterious circumstances (a car “accident”). As a result, everything within the Goldmoon crime organization is thrown into chaos as the under lords immediately begin to plot against each other to fill the power vacuum. What they don’t know — what these rivals can never know — is that for the past eight years they have been spied upon by an undercover cop, Ja-Seong (Lee Jeong-Jae), and during that time he has gained the trust and confidence of Jung Chung (Jung-Min Hwang — Dancing Queen, Happiness, A Bittersweet Life, etc. ), one of two lieutenants (coupled with their minions) who are vying for the top spot. Easy. Ja-Seong simply rats them out, the entire organization collapses at this critical moment and South Korea is rid of a major problem. Easy to say, but after eight years on the inside it is not so easy to pick sides … to know for certain what is right and wrong. Like chess pieces on a board, Hoon-Jung serves up a series of intricate moves — action set-pieces — with the “hero” at the center of the Machiavellian mayhem. And we mean action! 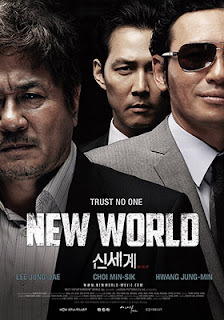 New World delivers it in spades!! Bonus features include a photo gallery and a behind-the-scenes production featurette.